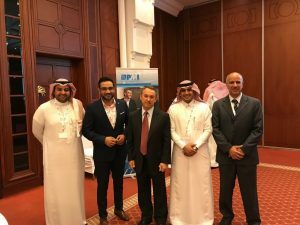 Media - Events - N The Mentor Group International Ltd.
Michael Sypsomos, the CEO of The Mentor Group was invited to speak at the PMI Conference held in Bahrain and Kuwait, on December 6th and 7th, 2017. 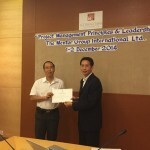 The theme of the Conference was “Project Leadership Through Excellence and Innovation”. 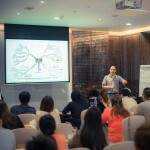 Michael shared a practical recount of lessons learned from his personal adventures over the last 40 years, that he encountered through leading or coaching projects with his presentation “A Personal Journey of Project Leadership and Innovation Lessons”. 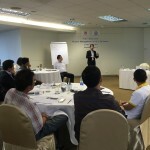 He shared priceless lessons that are neither taught in schools nor are part of the conventional Project Management training; these experiences did not only apply to organizing, planning and executing projects better, or develop fit-for-purpose Project Management Offices, but also were used to overcome difficult times and often used as survival strategies. 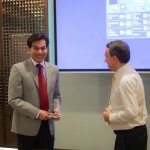 This presentation shared actual stories from his various leadership or coaching posts he has held with companies like CITGO Petroleum, ARAMCO, Chevron, and PTT among others, in the USA, Saudi Arabia and Thailand among other countries, that resulted in savings and other positive outcomes. 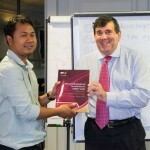 These accounts range from finding creative ways to turn a negative organizational Project Management culture into a world class PMO, turning a good Project Management organization into an exceptional one, to how he coached the planning and execution of a project that was granted the Runner Up position in the prestigious PMI Project of The Year Award. The audience walked away with many creative ideas that they will carry back to their projects and companies, and implement for immediate results. 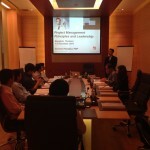 This workshop was conducted by The Mentor Group at Cargill Meats (Bangkok, Thailand) for ERP project team. 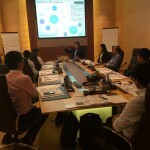 There were approximately 50 participants from several locations who had diverse background & experience in projects. 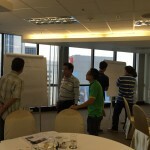 The workshop was designed based on group discussion and exercises. 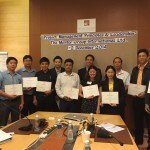 It provided fundamental understanding on project management processes & methodology to execute projects including soft skill – ‘Effective meeting. 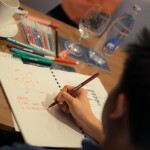 People enjoyed the interactive style-workshop, while they gained more confidence to execute their own projects in a more effective way. 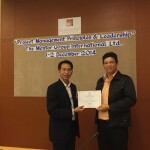 The Mentor Group International, under the sponsorship of PTIT (Petroleum Institute of Thailand) held a special workshop in Rayong Province, named “Project Management for Petrochemical and Refining Industries”. The participants were mainly senior representatives from various industries from the MapTaPut Industrial Complex. 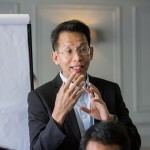 Michael Sypsomos, PMP, CEO of The Mentor Group and Khun Sorawut Pairojkul, PMP, MD of The Mentor Group, in a highly interactive environment, shared common project management pitfalls, solutions and lessons learned in the petrochemical and refinery industries, as well as best practices used in successful international organizations. From my personal project coaching experience of over 20 years, and our coaches at The Mentor Group, the following are the most commonly recurring problems we hear from frustrated and often stressed project executives asking for our help. There are many dimensions to these problems and varying degrees of severity based on each situation, the particular industry, demographics, culture and size of the clients company among others, but nevertheless they surface time and time again. 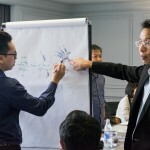 As Project Management Coaches, we spend as much time as necessary with each executive or project manager in order to thoroughly understand the issues which very often extend beyond the technical, and well into interpersonal challenges; we then work closely with them and empower them to develop their own solutions, which will address their particular situation. The results have been nothing less than spectacular and surprising for the clients in all cases. 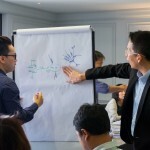 We have been getting immeasurable satisfaction helping these executives who have reached their wits end and feel they have run out of options, to consistently turn failing projects around, make better and quicker decisions and in general getting unstuck and create amazing value for the company and themselves. Before going further, it will be appropriate to clarify that the definition of “Project Executive” has a wider meaning here, and includes anyone who makes project capital related decisions, assigns and often manages project resources and is responsible for “Go/No Go” decisions at project phase gates. As such, it includes people from the President to C-Suite Executives to Project Managers. 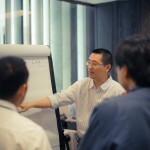 The too common problem of the “accidental Project Manager”; often assigning individuals as project managers simply because of availability, without considering skills and expertise, results in the Executive having to personally babysit the new project manager and spend too much time in solving day to day project issues. 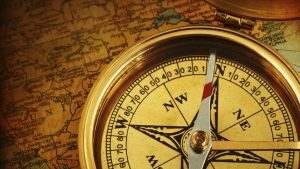 Very often we have traced project failure to poor decisions made at the initiation phase and phase gates’ “go / no go” points, or slow decisions resulting in missed opportunities. Too often projects are doomed to fail, as lack of support from stakeholders contributes to difficulty in acquiring funding, resources and support on key decisions and an overall increase in a variety of risks affecting the project in a detrimental way. The impact of less than adequate communication, which includes having unclear roles and responsibilities for the team members and decision makers, inadequate status updates, etc., leads to inability in keeping stakeholders engaged and the project teams are confused and often de-motivated. Unclear accountability between individuals results in duplication of effort, work that is delayed or incomplete, lack of commitment and potential conflict. Inadequate reporting reduces the opportunity to raise issues in a timely manner and it often creates lack of trust. Surprisingly we see this happen too often. No one likes to admit making the wrong decision, especially when there are political, emotional, financial or cultural implications involved in changing direction. Ignoring warning signals instead of taking a corrective action could lead to project failure, not to mention personal failure. When the scope is not clearly defined up front and there is no procedure in place to manage changes, it is inevitable that the project will take a life of its own and expand until it explodes. Among the associated problems that we see many executives face are unscrupulous contractors taking advantage of the lack of scope definition and turning them into “cash cows” by translating the scope to their advantage. Unrealistic deadlines and over optimistic cost estimates always result in missed delivery dates, poor quality, low morale, cost overruns, and a loss of respect for organizational leadership. 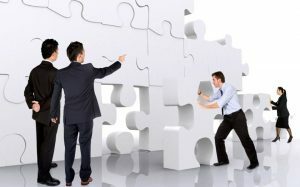 Lack of a consistent and repeatable Project Management methodology, or not having a PMO (Project Management Office) in place has been one of the main reasons of project failure, and it often results in increased project initiation time, a long learning curve for project team members and additional time spent to reinvent processes and templates for each project. In subsequent articles, I will address some clever, some surprisingly simple and some more complicated solutions we helped create for clients. 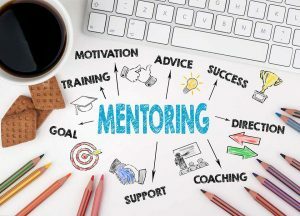 For more information on how The Mentor Group can help turn your project challenges around, or to arrange for a complimentary coaching discovery session with me, you can contact us at office@mentor-group.org. 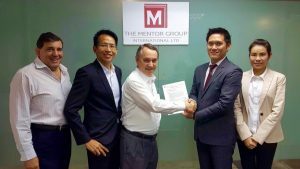 The Mentor Group International Ltd. and Ingenious Simulation Co., Ltd. signed a Partnership Agreement at The Mentor Group’s headquarter office in Bangkok, Thailand. 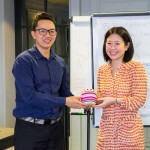 This partnership is for the co-development and application of the Project Management training simulation board game “The Prime”. 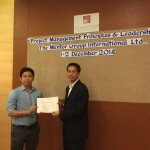 This game is designed to be an integral part of The Mentor Group’s Project Management training workshops which are offered to the construction industry and is expected that it will greatly enhance the practical side of the learning. 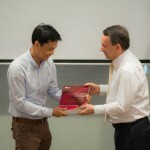 In the picture from left to right are Stephen Vianelli, Sorawut Pairojkul, and Michael Sypsomos of The Mentor Group, and Sotas Jaroenchaiyapongs and Sornkanok Apichanapong of Ingenious Simulation. 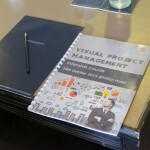 Visual Project Management is a unique course that utilize Mind Mapping to teach you to finish projects on time, within budget and meet the requirements according to PMI (Project Management Institute) standard from America. 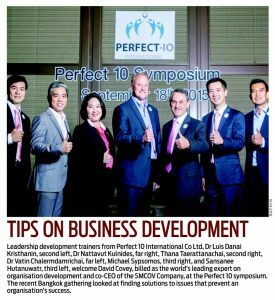 Michael Sypsomos of The Mentor Group participated as a member of P10 participated in the Perfect 10 Annual Symposium on the 18th of September 2015 at the Hilton Sukhumvit. Michael spoke on the topic of “Creating Efficiencies in Projects and Organizations”, explaining the basic principle of Project Management and how to apply it to various type of companies across a spectrum of industries, along with other internationally prominent speakers, such as David Covey (shown in the middle), Dave Allen, author of “Getting Things Done”, and others. 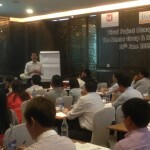 Khun Sorawut was a speaker at PTIT Public Training Course about Project Management for Oil & Gas Sector. Projects in the oil and gas industry are always large, complex and capital intensive. Therefore, a comprehensive knowledge and understanding of project management is essential to have any chance to successfully complete these projects on time and within budget. 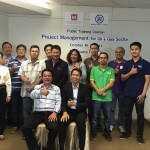 This intensive 2-day workshop-style course is designed to thoroughly present the subject and practice of Project Management of Oil and Gas projects. You will learn how to balance time, cost and schedule constraints in order to maximize stakeholder satisfaction. 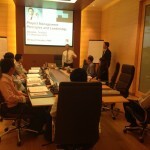 You will also learn how to objectively and accurately measure project performance. In addition, the course provides a “hands-on” approach to managing projects in the Oil and Gas industry, throughout the various project phases (Initiation to Planning, Engineering and Construction, Monitoring and Controlling, Performance Management and Close-Out). The course is aligned with the Project Management Institute’s (PMI®) A Guide to the Project Management Body of Knowledge (PMBOK® Guide) and is ideal for anyone working in a project team environment required to manage increasingly challenging projects in the Oil and Gas industry. 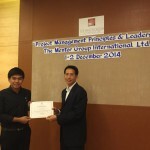 Visual project management course held on 26th of June 2015 at The Hilton Sukhumvit Hotel. In this course you will learn how to Project Charter, Work Breakdown Structure, Project Organizational & Resource assignment, Stakeholder Management, Scheduling, Eared Value Management, Change Management, Risk Management, Effective Communication Plan,etc. 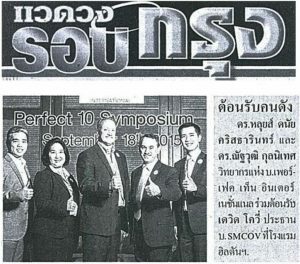 Michael Sypsomos, on the 19th June 2015, attended the Petroleum Institute of Thailand (PTTIT) 80thJoint Meeting of the Advisory Board to the Council of Trustees, Council of Trustees and Member companies, as the representative of The Mentor Group International membership. 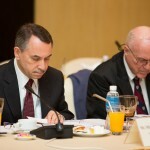 The Annual Joint Meeting was chaired by Dr. Tongchat Hongladaromp, Vice Chairman of the PTIT Foundation Board. 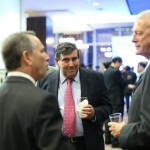 Later in the evening, the Institute held the Annual Dinner, attended by Michael Sypsomos, Stephen Vianelli, Michael Schweitzer and Sorawut Pairojkul. There were approximately 400 attendees from the government, academics and members of the petroleum, energy and related service industries joining the evening functions. The highlight of the evening was the talk given by Dr. Suvit Maesincee, Chairman of the Ad Hoc Committee on Thailand’s Vision and Future Design of National Reform Council. 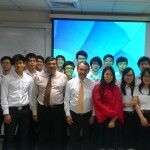 On the 21st of April 2015, Michael Sypsomos and Stephen Vianelli on behalf of The Mentor Group were invited as guest lecturers at Chulalongkorn University and the Asian Institute of Technology to speak to two groups of students on the topic of “The key factors for the success and failure of Project Management”. 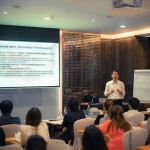 Practical experience was shared in these sessions, in order for the students to gain some context to support their studies in this area, and potentially use the Project Management principles in their careers and as a life skill. 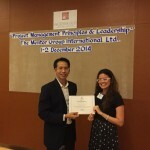 The Mentor Group continuously strives to develop the skills and competencies of Thai youth and encourage young people to get more involved in Project Management, as the Kingdom needs more qualified people in this discipline. 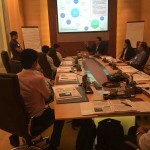 By transferring our knowledge, experience and expertise to the Thai youth we firmly believe that we can help Thailand’s Project Management industry to grow rapidly and contribute significantly to the overall advancement of the country. How often do even minor communication issues eventually turn into major problems with drastically negative impact? Unfortunately, too often would be a suitable answer. A cost-effective and results-proven solution for communication and monitoring and reporting problems within an organization is the successful implementation of a Project Management Information System (PMIS). A Project Management Information System (PMIS) is the “central nervous system” of any project. It supports all stakeholders to remain constantly aware of the project status in critical areas such as cost, time, scope and quality requirements. In addition, it clearly defines the roles and responsibilities of the project team members. Furthermore, it efficiently manages documents of all kinds (contracts, permits, approvals etc.) so that they can easily be retrieved and produces standardized and customized reports that are readily available and conveniently presented on easily monitored dashboards, essential for speedy and accurate decision making. Overall, it fosters collaboration and communicates best practices and policies that enable the project team to successfully execute the project. Optimal communication and collaboration requires a common understanding of purpose/requirements and the relevant facts. A PMIS will never fully replace face-to-face meetings, but there’s too much information on even the smallest project to hold in our brains. 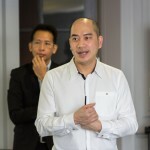 Therefore, all projects – especially the larger-scale ones – can greatly benefit from a computerized information system that gathers, organizes and disseminates valuable project information to all stakeholders in a systematic manner. Eliminating miscommunication among projects team members and providing the same accurate information to everyone promotes team cohesiveness and that can be the determining factor for project success. Here is an astonishing reality: In the absence of a properly structured and well-functioning PMIS, any project will almost certainly fail to accomplish its targets in the critical areas of budget, schedule and scope. A PMIS helps managers perform their roles better because it furnishes them with comprehensive and up-to-date facts about the project as well as instant access to the entire project history. Therefore, management is equipped with a clear understanding of the project progress instead of half-truths supported by biased selections of information. Based on this crucial information, managers can make timely and well-informed decisions about the continuation of the project and safely guide it to successful completion. Without the systematic supply of accurate project information, management may act on the wrong information and cause cost overruns, schedule delays or even complete project failure. 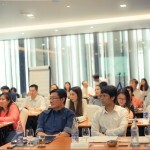 As more and more Thai businesses are seeking external assistance from companies with more expertise in certain areas, it is imperative that a clear distinction be made between a “Consultant” and a “Coach”. Consultants are normally hired for one of two reasons: either as a means of “outsourcing” specific functions or to gain a body of knowledge and expertise that is not generally available within the company. Business Coaching, by comparison, is highly personalized and aims to enhance the performance of individuals or perhaps small teams. Whereas consulting is largely technically focused,coaching is heavily inspirational and empowering. The main purpose of coaching is to help people uncover and implement their own solutions, for the greater benefit of the organization’s performance. Coaching, always involves a trust based commitment between the coach and a specific individual/team in which they agree to be accountable to each other, and work jointly towards specific goals that create efficiencies in projects or organizations. 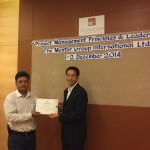 The Mentor Group utilizes this unique and customized mentoring and coaching approach. The all-important difference resides in the fact that TMG’s approach reinforces and instills specialized knowledge to the individual and/or organization and ensures ownership and lasting internal capabilities. Our expert Project Management Coaches and Mentors coach your project managers and project teams to ensure that all stakeholders and project members are in perfect alignment, motivated and committed and successfully plan and execute any project. 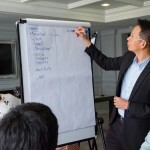 We facilitate focused planning workshops during which our coaches work alongside your project manager and project team to put in place planning and implementation requirements among other things. Our support spans throughout all project phases to ensure all processes are in place and optimally functioning. In order to be successful in any endeavor, first and foremost you must ensure that you have the right people for the task at hand. Project management is no different, since even when you have all the right project processes and systems in place, without the right people to supervise and operate them, the effort to achieve success will be futile. 1. Create the perfect team. In an ideal world, you would be able to beforehand assess and select the people that would join your team to ensure maximum compatibility and team cohesiveness. In reality, that rarely is the case. Regardless, you can still minimize friction between team members by defining clear roles, responsibilities and goals to make sure everybody is moving in the same direction and no one is stepping on anybody’s toes. 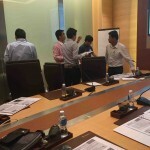 This can be achieved through a team kick-off meeting. In this meeting it’s important to establish clear communication channels for your team’s members so no information is lost and all stakeholders are always kept informed. If you wish your team to be able to successfully work together over a long period of time, it is essential to help foster healthy relationships within it. Through a social event outside the workplace, in a less formal environment, the distance in hierarchy and/or physical proximity between team members can be shortened or even become invisible. This will enable them to come closer together in many ways and build a great amount of trust among them. Team-building events come in many forms, such as a pizza dinner after work or a 3-day trip at the beach. The key here is being creative with the resources at your disposal. It is best to hold the team-building event at the initial stages of a team’s formation, as to help bring it together as soon as possible, but it is also important to repeat them throughout the duration of the project in order to share lessons learned and reinforce trust and togetherness, which in turn will maintain productivity at a high level. 3. Sustain your successful team. Is your team doing a good job? Let them know! It’s very important to acknowledge team success to keep team morale and productivity at high levels. It is also very important to make sure to give credit to the person who deserves it, not the one who appears like he or she does the most work. Last but not least, always remember to frequently check-in with everybody on the team to make sure that any problems that may arise are addressed before they cause problems in performance. o Personnel assessment. With our state-of-the-art personnel assessment systems you can be sure you are adding the right people to your team. o Team Building. 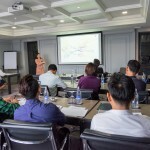 By organizing a unique set of team-building activities, specially designed to suit your needs. 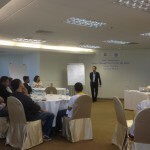 o Competency Mapping and Development. Identifying strengths and weaknesses of your team’s members and help them unleash their full potential. 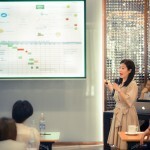 Stakeholders greatly influence the intended outcome and success of a project. Their involvement can take place during any stage of the project; however, performing a stakeholder analysis during the initiating stage will greatly influence the development of an effective project strategy and increase the chances for a successful project outcome. Many organizations express supporting stakeholder involvement by promising participation, but gaining stakeholder involvement is not always easy. Careful and thorough planning is essential to identify the right stakeholders and to ensure stakeholders participate in appropriate and effective ways. • The most powerful stakeholders should be identified early and their input will then be used to shape the project; this ensures their support and improves the effectiveness and efficiency of the project. • Support from the more powerful stakeholders will help the project gain access to more resources (People, money, etc. 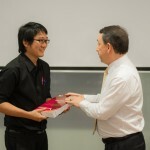 ), thus making the project more likely to become successful. • By communicating with stakeholders early and frequently, the project team will ensure that they (stakeholders) fully understand the project processes, and the benefits to the organization; this means they can support the project team more actively when necessary. • The project team will identify conflicting or competing objectives among stakeholders early on in the initiating phase of the project and develop a strategy to resolve the issues arising from them. 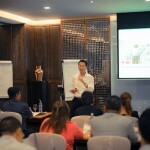 It is essential that initiatives that are sensitive, or have many different people involved who can influence the outcomes, identify the individuals and groups within the organization who will contribute to the development of the objectives and scope, identify those that will gain and those that will lose from its introduction, and then develop a strategy or how to best deal with them. 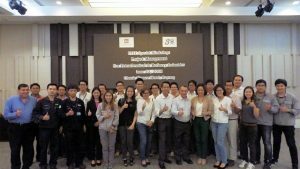 Most companies in Thailand still do not realize that gaps and inconsistencies in the way they use project policies, standards, and procedures from project to project, are what is causing poor overall project performance. Establishing a Project Management Office (PMO) would limit this frustration and integrate standards, procedures, and policies to make them uniform, thus improving project processes, and ultimately performance. The Project Management Office (PMO) is the single most critical tool for the success of any company and is what differentiates between a good project company and a great one. 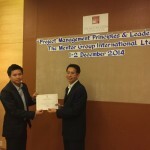 The PMO provides oversight for the overall management of projects and programs within an organization. Getting all projects under one overall standard helps improve efficiency, costs and execution of project deliverables. Project Management Offices (PMO) are often an understated tool that companies need, to improve quality, efficiency, and overall project performance. Implementing PMOs, companies benefit from successful project planning, execution, and the improvement to their bottom-line profits. It will also ensure that company resources are not being squandered, and are utilized in the most efficient way. “Operations keeps the lights on, strategy provides a light at the end of the tunnel, but Project Management is the train engine that moves the organization forward.” — Joy Gumz . The dictionary defines a team as a group of people working or playing together. But anyone watching a swarm of 6-year-olds playing soccer, with each child focused on his or her own performance, knows that definition lacks something. Imagine the challenges faced by a newly formed orchestra, composed of highly trained specialists, each capable of a solo performance. When we remove any one of these four essentials, a very different picture appears. If you’ve ever had to recover lost luggage in a foreign country without a common language, you don’t have to imagine the disaster that can be bred by misunderstanding. 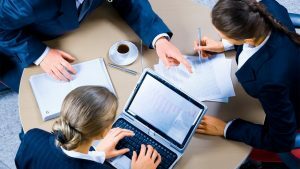 With the business environment becoming more challenging and margins tighter, many corporations are starting to appreciate the value of Project Management, and see as vital that the principles and applications of the Project Management process are thoroughly understood, and applied at all levels of the organization hierarchy. 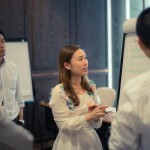 Through coaching, the project managers can develop these important soft skills in real time, while managing the project. 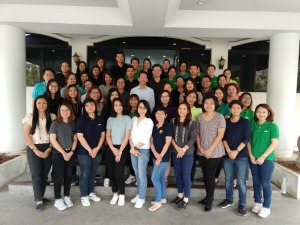 • Companies that adopted a coaching approach, report significant improvements in productivity, increased communication, faster goal achievement with less effort and reduced staff turnover. • Coaching is a partnership focused on the client’s success. 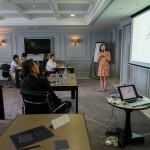 The coach will ask questions to empower the client to arrive at the best solution. 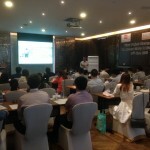 In contrast to the coach, a consultant provides a specific solution and goes away…. while the coach will ensure that the client develops the capability so that they think and solve the problems on their own. A coach does not have to be an expert in the field coached. • Mentoring is similar to coaching, but the Mentor is an expert in the field and will transfer his expertise to the client. 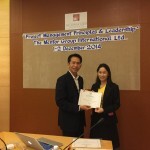 The Mentor Group is proud to be involved in supporting the local Thai Community. 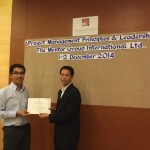 The Mentor Group recently became involved in a new venture based in Pakkret, Nonthaburi called the Thanksgiving Home, a legally registered non-profit organization. 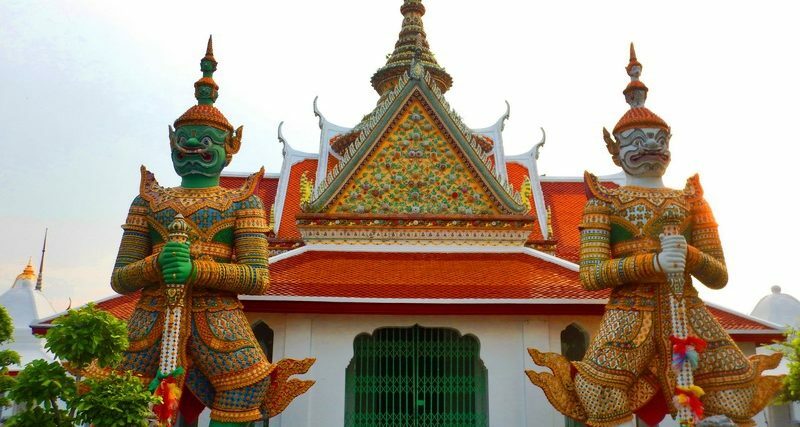 Thanksgiving Home opened its doors in January 2012 by Khun Wanchai Tripiyachart and his wife, Khun Maetim. The home accommodates fifteen young adult mentally challenged girls with varying degrees of disability. The goal of the Home is to educate and rehabilitate these young adults to become independent and to ultimately live and work in the community. The girls are learning skills such as hairdressing, Thai massage, Thai dance, music, art and English language. 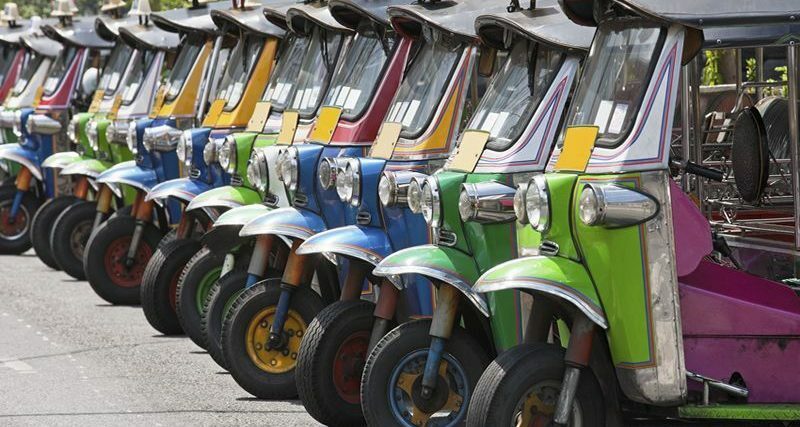 They also attend a local Thai school. They have proudly learned some fun skills such as magic tricks whereby they perform magic shows at local International schools and shopping centers, where they are warmly welcomed. Most recently, in April 2012 they performed at Ship for Southeast Asian Youth Programme at Ministry of Social Development and Human Security and in 2013 anticipate performing in Malaysia. Unfortunately, some of these girls are from abusive homes and have experienced living life on the streets of Bangkok. Thanks to Khun Wanchai and Khun Mae there is now Thanksgiving Home, where their motto of Love, Value, Truth is practiced on a daily basis. The Mentor Group was proud to make a monetary donation in March to assist in funding for the girls to join other Thai government homes on a trip to the beach. These young enthusiasts, with a love of life, enjoyed their first trip to a beach and their first swim in the ocean.